Home > Holidays > Halloween > Orange Beet Borscht Tell Them It’s Pumpkin Soup! Orange Beet Borscht Tell Them It’s Pumpkin Soup! Orange Beet Borscht?! AAAH! EEEK! OK, it’s not that scary, actually red beet borscht would be awesome as blood for your vampire friends this Halloween. But, if you have more than just vampires and zombies coming, organic Orange Beets aren’t as scary to the beet shy. I know about these things, when I was young, you couldn’t get me anywhere near Borscht. No one could convince me that it wasn’t some ancient blood ritual passed down from generation to generation as a right of passage into adulthoood. If you ate it and lived, then you became a WOMAN(or MAN). It took me thirty years to try Borscht and of course I loved it. So, that’s why I think this Halloween you would be better off telling them it’s pumpkin soup! Otherwise they may take thirty years to try it and that would truly be Horror-able! I know that was lame, so sue me! It’s Halloween time, consider that a trick. Trust me, the Orange Borscht is a real treat! Wash and chop all vegetables into about 1 inch squares so they cook at the same rate. Place all vegetables into a 12 quart pot and add cold water to cover. Add bay leaves, salt and pepper. Bring to boil and reduce immediately to simmer for and hour or until vegetables are softened. Add vinegar during the last 5 minutes. 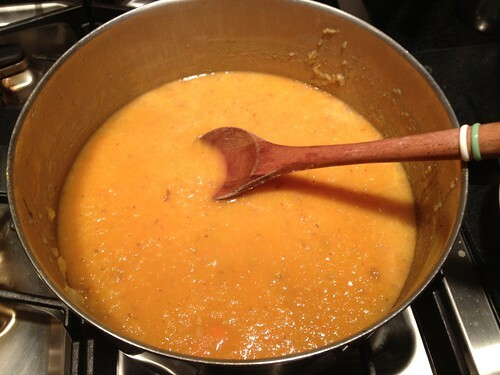 Use hand blender or blender or food processor and blend 3/4 of soup till smooth or blend all for a smoother consistency. Serve hot or cold. (I prefer hot) Top with a dollop of sour cream or yogurt if desired.